Sending large attachments by email can cause problems because images, videos or large documents often exceed the maximum file size allowed. This is becoming increasingly problematic because more and more data is generated every day. Countless image and multimedia files created using smartphone cameras are proof of this. Research shows that the average size of the files that users want to send as email attachments is growing from year to year. This puts a strain on corporate email infrastructures, resulting in bans on the sending of large files, the setting of limits or a case-by-case basis approval policy. How can I send large email attachments? Compressing data only results in a small reduction in data size and means additional expenditure of time, making it unsuitable for professional use. Services popular among private users, such as Dropbox, can be used as stand-alone applications that can also be used to send large amounts of data. In this case, the user first uploads the data to the server of the respective provider. Now a link is created which is sent to the recipients. These recipients can then download the files from the provider’s server. The problem is that the data is provided on an external server. 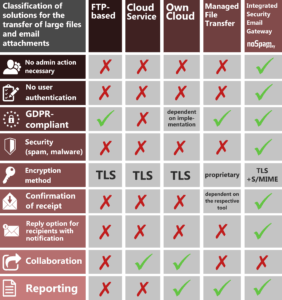 In many cases, the connection is unencrypted and therefore insecure, especially in view of security-critical business requirements and the General Data Protection Regulation (GDPR). In addition, the use of such services promotes the emergence of a so-called “shadow IT”, as data is exchanged without authorization by the IT department. Some providers advertise the fact that the data remains on company-owned servers. But here, as with managed file transfer solutions, they are separate applications without integrated security solutions. Additional software must be purchased to fight spam, malware, spyware and ransomware. The same applies to FTP-based solutions, the installation and operation of which, for example regarding user account management, is often time-consuming. There are also more convenient and secure ways to send large email attachments. With specialised software, users can send files of any size, straight from the email client. The integrated Secure Mail Gateway NoSpamProxy® Large Files integrates seamlessly into the existing IT infrastructure, including Microsoft Outlook. Large files can be sent the same way as traditional emails, at the click of a single button, as a conventional attachment. The software automatically separates the attachment from the email and ensures that the connection is encrypted. A single click is also all it takes to download the attachment; the data is provided via a dedicated server and transmitted using SSL encryption. This meets all IT governance requirements such as secure, encrypted and compliance with GDPR. The recipient can respond to the sender in the same way and send one or more files via the Web Portal. With NoSpamProxy® Large Files not only large amounts of data can be sent. The user interface of NoSpamProxy® Large Files offers, for example, reporting functions to track the use of download links or to determine how to handle email attachments based on rules. 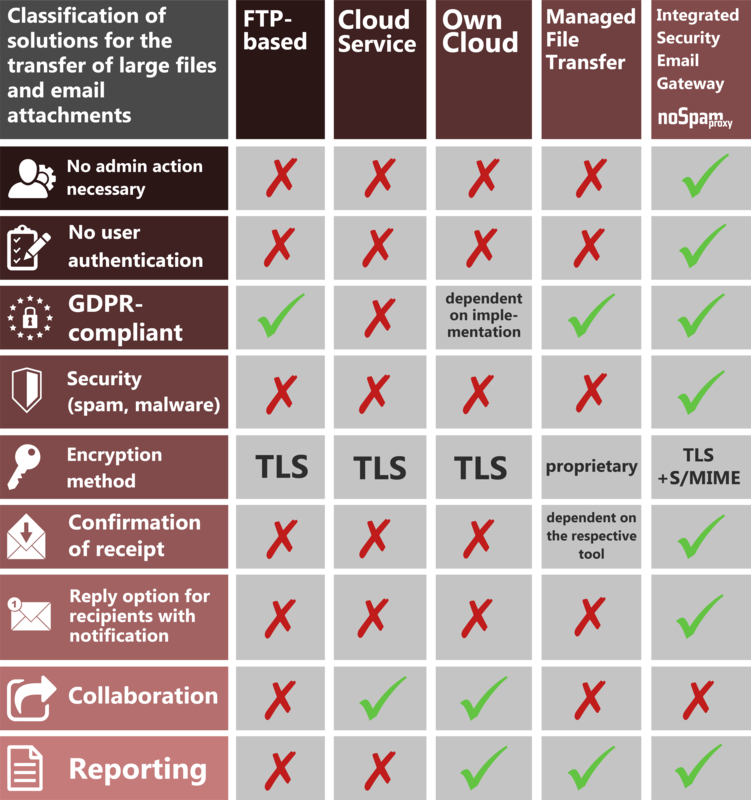 In combination with NoSpamProxy® Protection, the company is also proactively protected in real time against spam, ransomware, malware and spyware. The integrated Secure Mail Gateway NoSpamProxy® Large Files makes it easy to send large files. At the same time, the company’s IT infrastructure is relieved, and security is ensured through encrypted connections and data transfer. 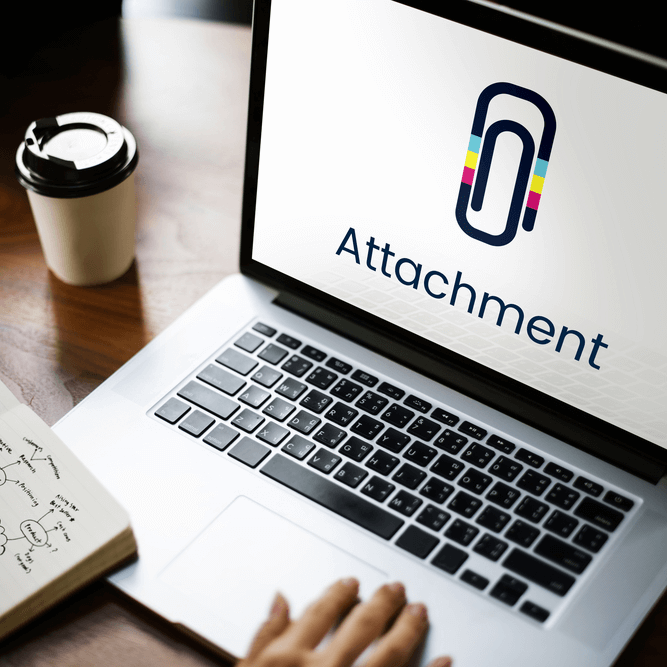 Full integration into the existing IT infrastructure and central attachment archiving ensures that users can send large files as easily as any conventional email.